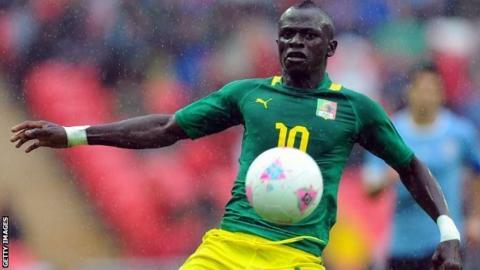 Southampton and Senegal midfielder Sadio Mane will miss the Africa Cup of Nations because of a calf injury. Mane, 22, suffered the injury in Saints' 2-0 Premier League win over Arsenal on 1 January and missed Sunday's 1-1 FA Cup draw with Ipswich. "Sadio has an injured calf muscle, it will be four to six weeks," Southampton manager Ronald Koeman said. "Senegal may call him up and see the player, but he will not play in the Africa Cup of Nations." The competition begins in Equatorial Guinea on 17 January and Senegal, runners-up in 2002, are aiming to win the competition for the first time. Coached by Frenchman Alain Giresse, the Teranga Lions face Ghana on 19 January, South Africa on 23 January and Algeria on 27 January in Group C.
Mane's injury could give an opportunity to former Chelsea striker Demba Ba, who was left out of the provisional 28-man squad, with Giresse expected to finalise his 23-man squad on 7 January. Southampton signed Mane for £10m from Austrian champions Red Bull Salzburg in September and he has scored five times in 14 Premier League appearances to help Saints up to fourth in the table.